Ever been to a tasting? With great pleasure, we’d like to announce our next SLC Mixer – Cocktails and Techniques II presented by The Wine Academy of Utah and SLC Mixers. 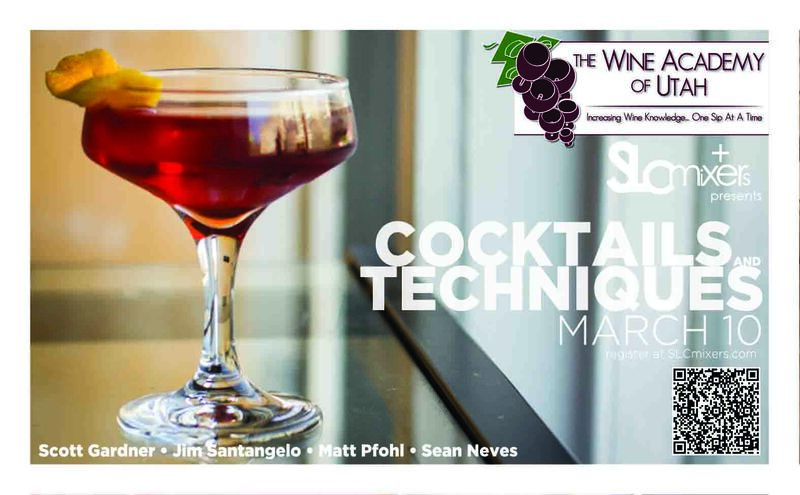 We’re hosting four brilliant bar tenders and mixologists from Salt Lake City – Sean Neves (Wild Grape Bistro), Scott Gardner (Finca), Matt Pfohl (Pallet) and Jimmy Santangelo (Copper Onion). In the fall we did a beta version of this that worked out really well inspiring Jimmy at the Wine Academy to do another one. This time we’ll be focusing a bit more on the home bartender. Last time these guys showed you what they can do with the fine gear available to them at their respective bars. This time they’re focusing a bit more on what you can do at home. Here’s a little reminder of what we did last time – Cocktails and Techniques I.
Becky Rosenthal started SLCfoodie a few years ago in hopes of sharing her love of the emerging Salt Lake City food scene. She currently lives downtown where she also manages Vintage Mixer. Want to learn more?